In the airy hall of the South Shore Cultural Center (SSCC), the audience screamed with excitement when former president Barack Obama walked in with the first renderings of the planned Obama Presidential Center (OPC) in Jackson Park on May 3. The OPC is a once-in-a-lifetime opportunity for investment in the South Side—and the audience had reason to be excited, as the former president, with his usual charisma, introduced a “transformational” plan that’s supposed to revitalize the nearby neighborhoods with employment, training, and business opportunities. Although the library won’t be completed for another four years, this transformational plan has already been set in motion by Michelle and Barack Obama’s personal donation of two million dollars, half of which will fund a summer job program aimed at training young people to later work at the center. According to a Tribune article, one million dollars from the donation will go to One Summer Chicago, a city initiative that aims to train young people by funding summer jobs and internships, and another million will go to Chicagoland Workforce Funder Alliance to open apprenticeship pathways for young adults underrepresented in the building trades. Obama also promised that eighty percent of the construction hires will be from local communities and estimated that in addition to the 200 to 300 permanent jobs within the presidential center, more than 2,000 jobs will be created in the surrounding areas and 5,000 citywide. The Obama Foundation also formed an “Inclusion Council,” composed of leaders from civic and corporate groups, in October 2016, to ensure diversity and the fairness in the development process. Every time the former president finished a point of his plan for the presidential center, the audience roared with approval and affection. As Mayor Rahm Emanuel pointed out in his opening speech, “President Obama never lost touch with Chicago, and Chicago never lost touch with President Obama.” Within the town hall, this sense of solidarity and love seemed to be stronger than ever. However, outside the spacious hall of South Shore Cultural Center, there were also doubts and fears, embodied by members from Kenwood Oakland Community Organization (KOCO) holding a large sign with three letters on it: CBA, the acronym for a community benefits agreement. Ever since Jackson Park was selected as the location of the presidential center, local organizations started mobilizing, using a variety of strategies, to ensure that benefits will indeed go to the surrounding neighborhoods. Among the various groups, four organizations—Southside Together Organizing for Power (STOP), Bronzeville Regional Collective (BRC), Prayer and Action Collective (PAC), and KOCO—formed the Obama Library South Side Community Benefits Agreement Coalition and have been advocating for a CBA signed by the Obama Foundation, the University of Chicago, and the city of Chicago. A CBA is a legally binding agreement that is signed between a real estate developer and community groups affected by such development; once signed, the CBA would require the developer to provide specific amenities to the local community. For communities adjacent to the OPC, the specific benefits include hiring from the community, promoting Black businesses, providing affordable housing to prevent the dislocation of current residents, facilitating transportation, investing in education, and ensuring the sustainability of development. A CBA from the Foundation is not universally welcomed. The Woodlawn, Washington Park and South Shore Community and Economic Development Organization (WWPSS), previously profiled in the Weekly, is one of the skeptics, even though it shares similar goals to the CBA coalition. According to its new website, WWPSS aims to “build and strengthen commercial corridors, support business and non-profit incubation, development and recruitment, coordinate workforce development, and implement an inclusive housing strategy.” WWPSS was founded by Pastor Torrey Barrett, founder of Washington Park-based KLEO Center, and Reverend Byron Brazier, pastor of the Apostolic Church of God in Woodlawn; it is still in the process of selecting its board members. In an interview with the Chicago Defender, Brazier called CBA “an affront to America’s first Black president—Obama,” since “it suggests we don’t trust him.” However, if WWPSS is not embracing the CBA strategy, short of just presenting their ideas to the Foundation, it remains unclear exactly what kind of strategies it will use to lock down community benefits. It should be noted that there is little personal animosity from CBA organizers toward WWPSS. They are trying to achieve similar goals, though through different methods. When asked whether there is competition between WWPSS and the CBA coalition for popularity from residents near the OPC site, McKee Xi responded with a shrug. “There are people who show up in large meetings of both organizations.” Naomi Davis, one of the founding members of BRC, gave a more determined response, writing, “let us respectfully say that any attempt to pit the Black grassroots versus the Black middle class is a false narrative we firmly reject.” However, coalition members acknowledge the difference between the two groups. “Brazier and Barrett’s organization supports some trickle-down measure, and their hearts are in the right place,” said McKee Xi. “However, you could generate bad consequences with good intentions.” Although WWPSS is collecting opinions and advice from all South Siders, the lack of a CBA to ensure an equal distribution of benefits worries more grassroots organizers. On the other hand, the CBA coalition has its own shortfalls. First of all, it consists of organizations from three community areas (PAC is not a geographically defined organization), but not all communities that are affected by the OPC. However, with a legally binding contract such as a CBA, the stakeholders who sign on to the agreement are the ones with the real legal protection from gentrification and dislocation—and according to the coalition’s website, there are only signatures from KOCO, BRC, STOP, and PAC. This is despite the fact that, according to KOCO’s Executive Director Jawanza Malone, some community members from Washington Park have joined the coalition via BRC. Second, the specifics of the CBA are yet to be decided. Although the general principles listed on their website hit everything that the affected communities will ask for, from employment, housing, and education, to sustainability and transportation, the terms and conditions of the CBA haven’t been particularized and codified. “The Law Project is responsible for negotiating the specific contract with the legal teams from the University of Chicago, the City, and the Foundation,” said McKee Xi. “But the negotiation is never open in the first place, since they don’t want a CBA.” The Law Project is a project of the Chicago Lawyers’ Committee for Civil Rights to provide high-quality pro bono legal services to community nonprofits and small businesses, and it has been providing legal aids to the coalition from the beginning. There is a looming problem with the generalized form in which the CBA is currently presented: although all the current stakeholders agree on general principles, they could disagree about the specifics of the contract if the three institutions ever agree to negotiate. And internal conflicts are foreseeable if the coalition ever succeeds in opening up the negotiation—although Malone does not see it that way. 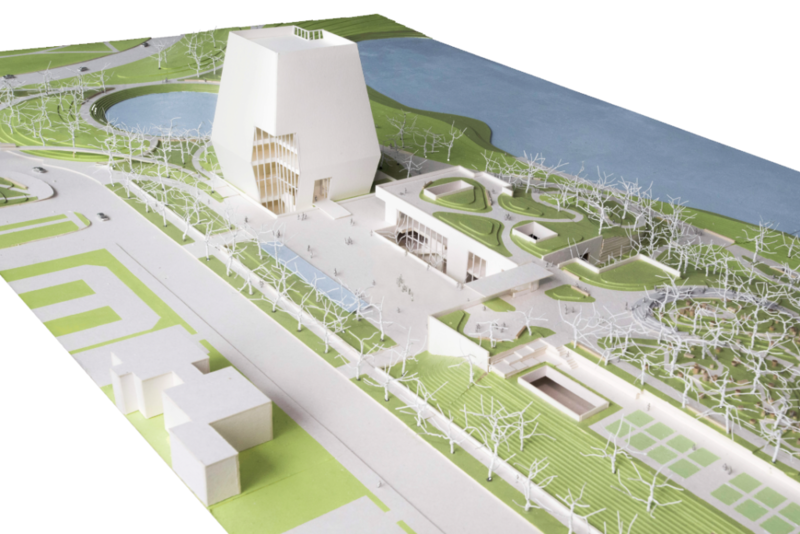 In the end it falls to the decisions and attitudes of the Obama Foundation, the UofC, and the city. During the presentation at the SSCC, Obama himself emphasized diversity. “What I’m afraid a lot of people are concerned about: jobs, contracts—how does it work? And here’s our bottom line: we will exceed whatever historic or legal goals have been mandated in terms of minority or women-owned business participation.” At the same time, he pointed out that this would not happen at the expense of hiring qualified candidates. However, the worry was never about the emphasis on diversity itself, since most stakeholders believe in the former president’s goodwill. The concern is all about the process by which diversity is obtained and whether it will polarize the South Siders or benefit the worst-off. The only institution that the Obama Foundation provided to ensure this process, in addition to working with WWPSS, is the Inclusion Council formed in October. Among the initial members of the Inclusion Council, only Melody Spann Cooper, of WVON Radio on 87th and Cottage Grove, and Perri Irmer, CEO of the DuSable Museum, are from the South Side. Consequently, many of those who are responsible for diversity are out of touch with the lives of residents who will be affected most immediately by the OPC. Behind the desire for a CBA lies the anxiety and fear of those who are disconnected from the establishment. And it is such anxiety that the Obama Foundation could address with binding institutions instead of paternalistic arguments which claim that the Inclusion Council knows what it is doing and a CBA is “pretty narrow tool” (as Strautmanis, the Foundation vice president for civic engagement, told WBEZ). The Obama Foundation remains unwilling to open negotiations with the CBA coalition on the terms of an agreement, while relying heavily on WWPSS, which has not even laid out a specific strategy. However, even with the Foundation’s endorsement of WWPSS, the CBA coalition has not backed down. On May 5, two days after the Foundation’s reception at the SSCC, the CBA coalition leadership gathered at the office of STOP to call people who’d showed up and left their contact information during the town hall, and to discuss with them the strategies they should use to call their aldermen and express their desire for a CBA. According to a May 19 email from PAC, 5th Ward Alderman Leslie Hairston would not support a signed CBA. Correction (05/25/2017): A previous version of this story stated that the Obama Foundation had not been willing to talk to the CBA coalition. In fact, the Foundation has talked with the CBA coalition multiple times, but has not entered into negotiations on a community benefits agreement.